Teletext ends its text info service today after 35 years on commercial television. The inevitable came after commercial profit and public interest fell sharply over recent years. Owner Associated Newspapers said back in the summer that Teletext had been loss-making and no viable business model could be found. Its competitor, the BBC's Ceefax service, has been supplanted by the BBC Red Button service on digital, while Ceefax itself will end when digital switchover is complete in 2012. 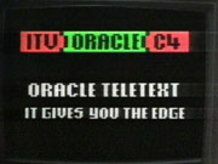 The service was started in the mid-1970s as Oracle on ITV but really came into its own during the 1980s, especially during the Falklands War when, according to The Times at the time "the public's appetite for instant information is being underlined by a sharp increase in sales of television receivers capable of [receiving Ceefax and Oracle]"
Not all the company's services are closing though; Teletext Holidays on Freeview channel 101; commercial channels on Freeview channels 102-107; and its travel websites are all continuing. The service cut jobs and outsourced content in a bid to keep afloat, but despite revenues of £41m in the last financial year it was doomed.